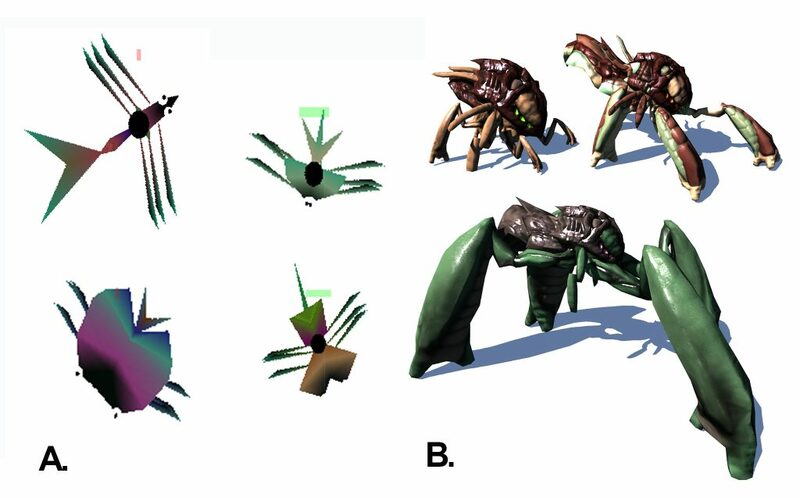 Interdisciplinarity in evolutionary science… and video game design. One year ago, my colleague Terry Soule and I embarked on a somewhat crazy idea – we wanted to make a video game built upon the principles of evolutionary biology. The two of us had dabbled in this area before, and reasoned that the combination of biology and computer science would naturally result in a cool evolutionary video game. Our early results were comically inadequate (Figure 1A). Figure 1. Procedurally generated creatures using a randomly mutating digital genome. A) The comically inadequate results of a computer scientist and a biologist. Their genomes determine their shape and color. B) Incorporating artists on the team can produce creatures that are fully animated and modeled in 3D. Their genomes affect most aspects of their morphology and coloration. These are early prototypes of creatures for this summer’s game. Our team was very clearly missing some key members. This is when we began to grasp the extent of the inherent interdisciplinarity in video game design – an enterprise requiring a startlingly broad swathe of University Departments. One needs programmers, to be sure, but a compelling game requires art and design (contrast Figure1A with 1B), story and characters, business and marketing, music and sound, and no small amount of evangelism on social media. If we want to make an evolutionary game – add a biologist or two to the mix. Last May, having learned from our early experiences, we established Polymorphic Games and began by recruiting such a team of undergraduates. Their task was simple (ish): Create an evolutionary version of the classic arcade game Space Invaders. We hoped they could get that done in 12 weeks, but were prepared for failure. After all, Terry and I had been collaborating on this project for 18 months and our results had been less than compelling. The team finished what we asked … in two weeks. We had learned a very important lesson: the benefits of interdisciplinary collaboration transcend scientific research. Over the course of the rest of the summer, the students of Polymorphic Games took that simple evolutionary version of Space Invaders and turned it into something unique. And as they did it we watched them learn the tools of interdisciplinary collaboration – communication, respect, an understanding of roles, elements of leadership, and clarity of the shared vision. It was an amazing experience that resulted in “Darwin’s Demons”, named after the metaphorical Darwinian Demon – an organism that can evolve without constraint. Darwin’s Demons is based on classic arcade games in which the player has to defeat waves of opponents. The evolutionary component was included by giving each opponent a digital genome that controls its appearance, traits, and behavior. After a wave in the game each opponent is assigned a fitness based on how well it performed against the player. Then each wave is treated as a generation in a generational evolutionary algorithm. The player controls a space ship, and must destroy all of the opponents in each generation. The player has a limited number of lives and loses one each time either the ship is hit by an opponent’s projectile, an opponent reaches the bottom of the screen, or the ship is hit by an opponent (some ships are immune to hits from the side, allowing them to move into and destroy, opponents that move too far down the screen). A concise (and much more visual) description of the science behind Darwin’s Demons is portrayed in our “science trailer” for the game. Once Darwin’s Demons was complete, a key question was whether evolution was serving its design purpose. Was it making the game harder? Was it making the game more compelling? In a recent conference paper at EvoStar, we tested these hypotheses. We concluded that incorporating evolution caused the game to get progressively more difficult. In fact, this result led us to coin our tag-line: Evolution Always Wins. Changing the fitness function also led to different evolutionary trajectories, as did different player decisions regarding ships, armaments, and defensive systems. Perhaps the most interesting result, however, occurred during one of our outreach activities. Prior to release, we hosted a high score competition at a University of Idaho video game event called Vandal Overnight. Our grand prize was that we would let the winner design a new ship for the game. Many players participated in the contest, and most fared poorly – they were only able to play the game for 4 to 5 minutes. A few players, though, were able to play continuously for more than 30 minutes. Were they more skilled? No. They were exploiting the evolutionary model. They were destroying the most aggressive and accurate aliens first, and letting the dumbest aliens persist for a long time in each generation. The result? They DOMESTICATED the aliens, turning them into metaphorical space cows that never fired projectiles and hovered stupidly in the upper corner of the screen. As educators in evolutionary biology, this outcome was truly wonderful. Exploiting the evolutionary model implies understanding of the evolutionary model. As game designers, this result was alarming. We reasoned that “Space Cows – the video game” would not be well received by discerning gamers. We had to modify our fitness functions prior to game release to mitigate this strategy. The sales aren’t bad for the first release for an indie game studio. But sales aren’t the point. I indulge in a loose comparison between sales of a game and citations of a published paper, I couldn’t be more proud of a work produced by a team of undergraduates. Their irritation appears to stem from the fact that the aliens in Darwin’s Demons did not evolve to become sentient. We have excoriated our team of undergraduates for failing to create SkyNet. This summer for sure! A new team of undergraduates have just begun “Project Hastur”, our new evolutionary game. The team consists of three programmers, two biologists, a musician, three artists, an evangelist, an entrepreneur, a creative writer, and a video production expert. I conclude that our ability to build and facilitate this interdisciplinary team was no accident. It was a direct result of BEACON’s unique culture – a culture that values a collaborative, interdisciplinary approach. With this new game, we hope to further push the integration of evolutionary principles with game-play. Project Hastur takes the struggle to the ground, where both the player and the environment will drive the evolution of the game opponents. Polymorphic Games will have an exhibitor’s booth at Evolution 2017 in Portland. If you have ideas about how to use evolutionary games for education and outreach, or if you just want to check out our games, please drop by. This entry was posted in BEACON Researchers at Work, Education, Member Announcements and tagged BEACON Researchers at Work, Digital Evolution, Education, evolutionary algorithms, Outreach, video. Bookmark the permalink.